Educational philosopher David Smith says that “kairotic time registers when we speculate that something happened when ‘the timing was right,’ a moment not measurable to a single source by any instrument, but intuitively understood as arriving when various elements converge to give cause” (Smith, 2014, p. 51). Today, I think we all felt kairotic time together. We began our day outside in our line. 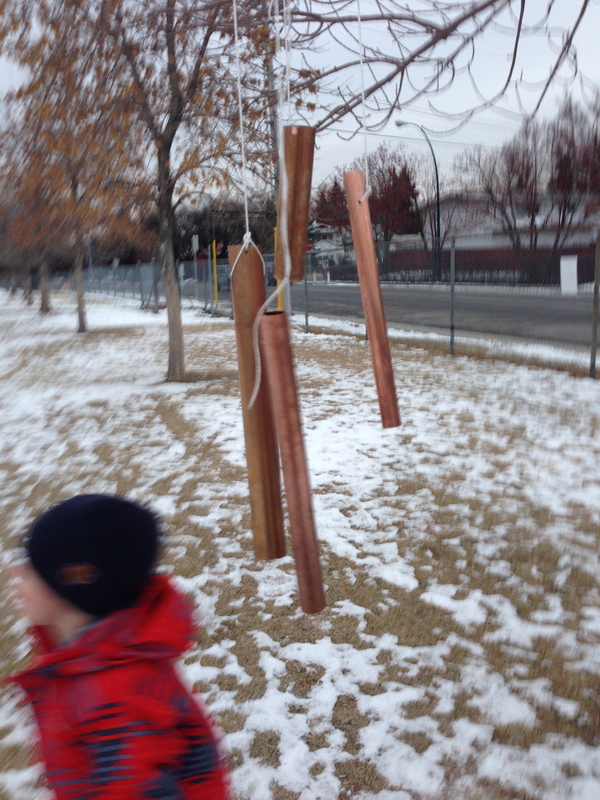 I was excited to show the children a prototype of a copper wind chime that my family had made on the weekend to begin our sound exploration. The pure joy of greeting each other began when Autumn proudly showed me that her tooth had (finally) fallen out. That prompted two others to show me gaps in the same place in their mouths! I was then presented with a beautiful bouquet and was informed that George’s family had gone for nature walk to find just the right treasures to put into this bouquet for us to wonder over, observe and enjoy. 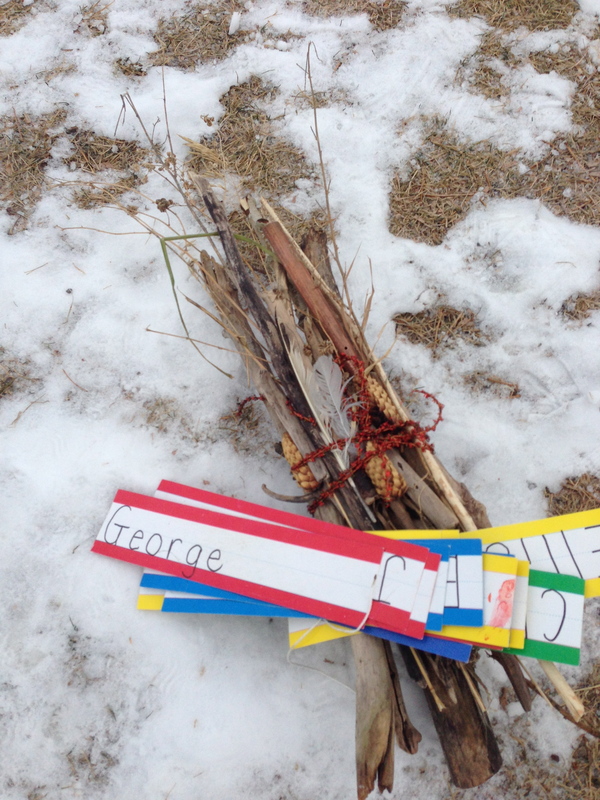 In addition to our daily checkin where we read each others names and talk about letters, sounds and syllables, this was a good opportunity to go past Je m’appelle and comment ça va. We talked about George’s family and the objects that he chose for the bouquet and where they came from. 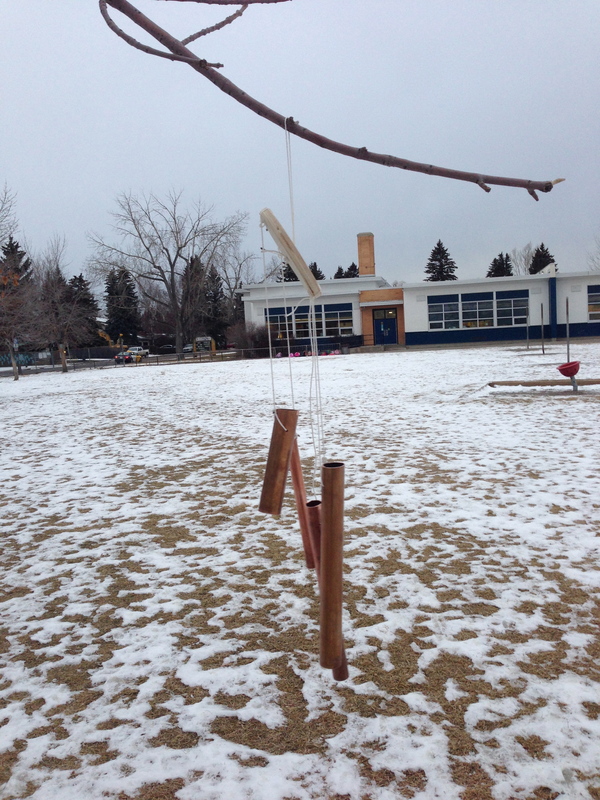 Then, we hung the wind chime in a tree and closed our eyes to listen to the different sounds that each pipe made. We observed that some sounded higher and lower. We guessed that might be because some pipes were longer or wider. Once we went inside, we slowly made our way to the carpet. Everyone seemed to be very relaxed and so happy just to be together in this place. Soon after we started playing, students discovered this large tube. 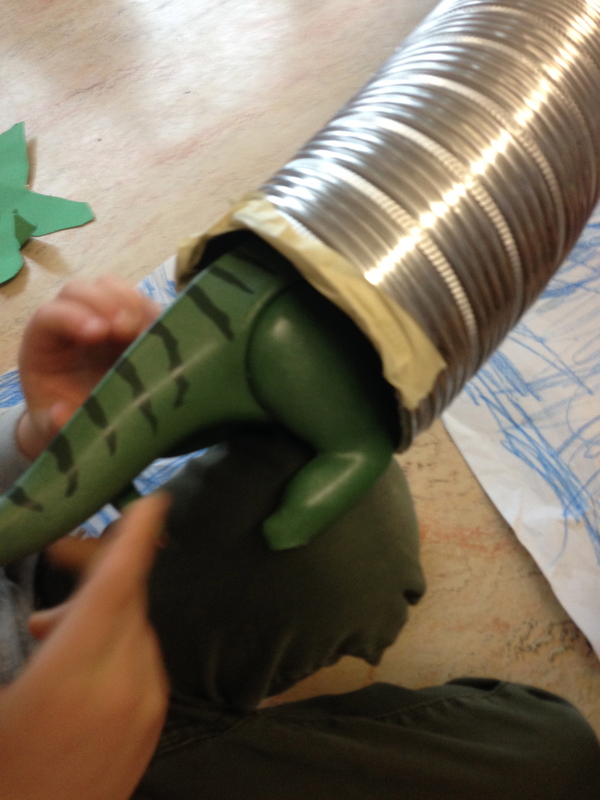 There were students singing and blowing into it,and of course, a dinosaur began to roar! Partway through play time, Ivy arrived from her two week vacation in Hawaii. We stopped and greeted her. I loved hearing students say bonjour and ask her how her trip was. Some even wished her Bonne Fête because she had been gone for her birthday. The next thing I knew, Anna and Sienna presented Ivy with cards, then George made her a snowy painting and searched for her name card to be sure to write Ivy’s name. My heart swelled at the outpouring of friendship. And then the math. When we were outside, Max had counted four pipes on the wind chime and then four big branches in the tree in which it hung. In the classroom, he wrote four on today’s date on the calendar and we all practiced writing four with our magic fingers. At snack time, Max noticed that there were four children at his table. We looked around and noticed that there were four children at every table. What a perfect opportunity to talk about different representations of four. While the students were eating their snack, I started drawing on the white board. Three boys and one girl. Two girls and two boys. Three girls and one boy. Four girls. 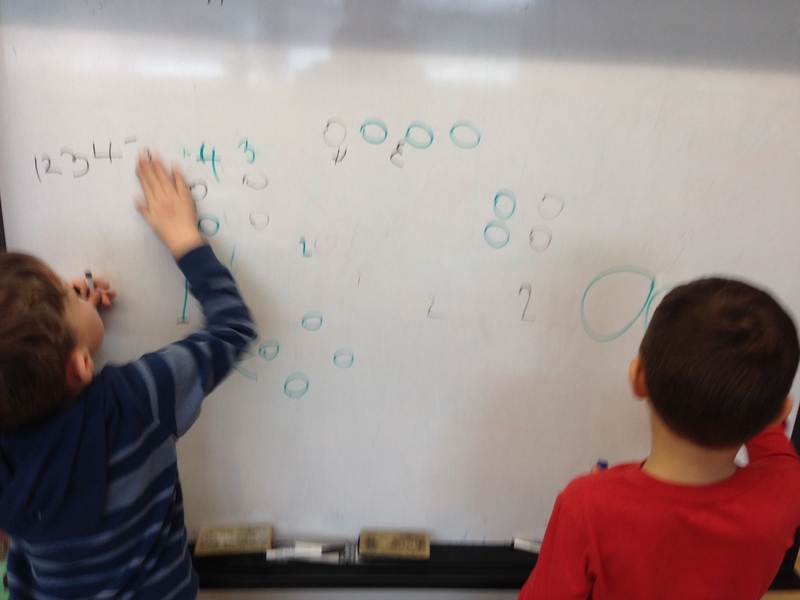 Students came over as they finished and started writing in the numbers to represent each group. 3 +1, 2 +2, 4+0, 3+1. What a great introduction to number stories. Still more. 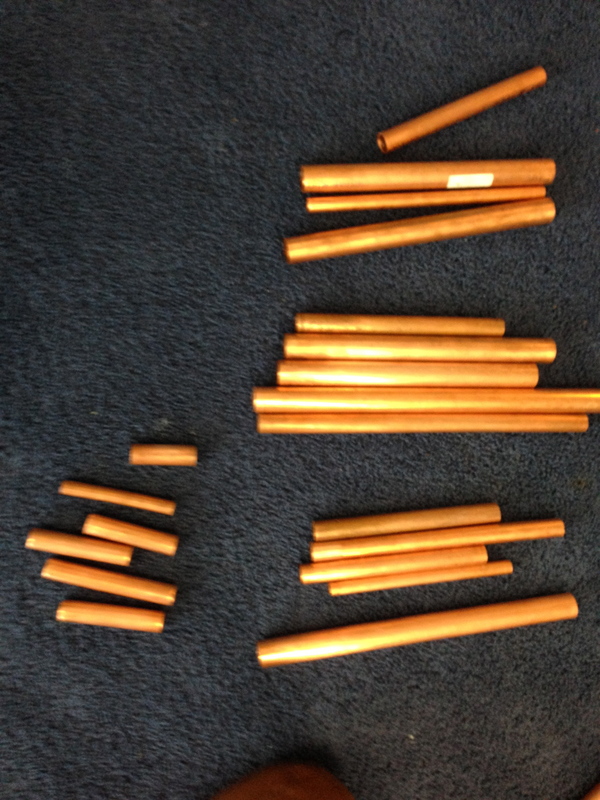 As Ellie and Isla explored the copper pipes for our sound exploration, they began to group them by length and count how many were in each group. 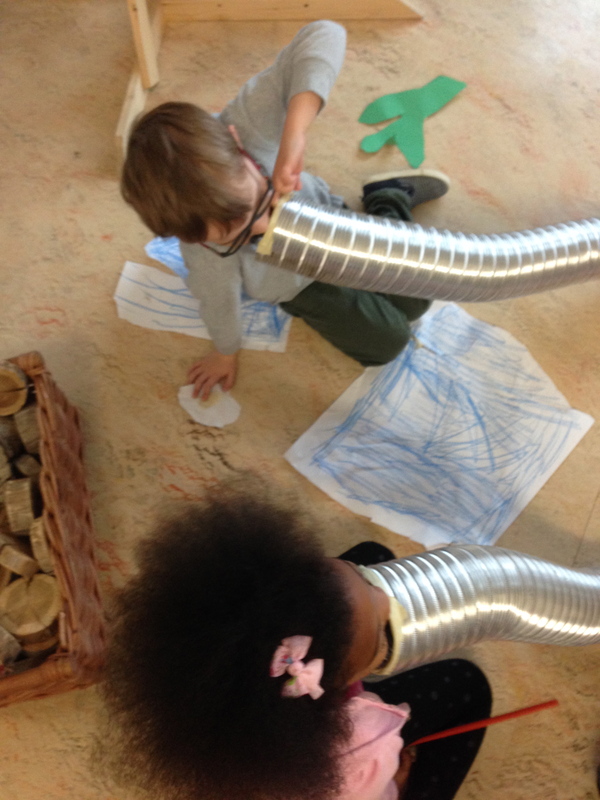 Construction began for a very large animal/dinosaur house in our block centre today. 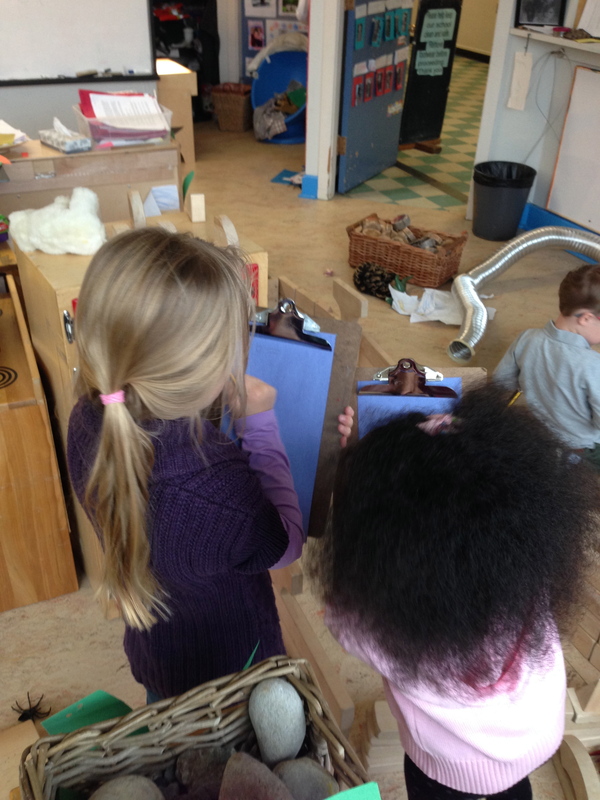 Two of the engineers were measuring the length of the sides of the structure and comparing notes. Smith, D.G.(2014). Teaching as the practice of wisdom. New York, NY: Bloomsbury Academic.